Carson Cottage è accogliente e confortevole monolocale in un tranquillo quartiere di lusso vicino a Sequoia Park. A pochi isolati da negozi e ristoranti a Henderson Center e solo una macchina veloce al centro storico. A Eureka proprio nel cuore della Costa Redwood, una base perfetta per sperimentare tutta la costa Redwood ha da offrire. Caratterizzato da un accogliente camera da letto matrimoniale con una zona situata salotto, un bagno accomodante con una vasca e doccia, una cucina completa con tutti gli elementi essenziali, e un angolo da pranzo appropriata che è perfetto per la casa pasto, intrattenere gli ospiti, così come uno spazio di lavoro dignitoso . La struttura dispone di connessione internet wireless gratuita, tutti gli elementi essenziali necessari per la cucina, zona pranzo, soggiorno separato, un letto matrimoniale, TV via cavo, lettore DVD, servizio biancheria, e l'accesso ad un cortile rilassante con un camino esterno e barbecue. Questo alloggio Eureka è una base perfetta per un'avventura Redwood Coast. Situato nel centro di Eureka, a 40 miglia a sud di Redwood National Park, e 40 miglia a nord di Humboldt Redwoods State Park, con coste mozzafiato in tutto. Carson Cottage è l'ideale per un soggiorno di breve durata ed è perfetto a lungo termine rimane così, a meno di un miglio di San Giuseppe Hospital Campus. Good location nice and quiet. Thank you for taking time to leave a review of Carson Cottage, we appreciate all the reviews we get from our guests. It sounds like this was a good fit for you and your partner, and we would love to have you back again soon! There's also a washer/dryer available in the building for guests to use, if staying for a bit longer. Located in a quiet and charming neighborhood also. Thanks again, and please look us up at Redwood Coast Vacation Rentals when planning your next trip to the North Coast! 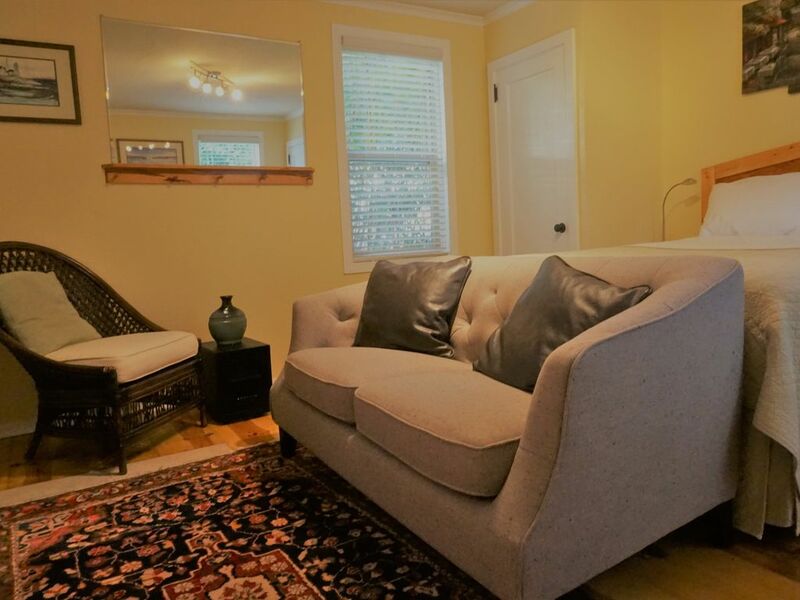 Great budget-friendly apartment for a quiet stay in Eureka. Easy access to surrounding areas. Thank you for leaving a review of your stay at Carson Cottage. We would love to have you back again anytime, please look us up at Redwood Coast Vacation Rentals when planning your next trip to the North Coast! With over 120+ properties. there is something for everyone. Carson Cottage is an affordable and cozy accommodation for one or two people looking for a place to call home while exploring all that the surrounding area has to offer. Thanks again for your review! This sweet studio set up was efficient and well set up. I had an OK stay. Unfortunately, the smell of insect spray greeted me at the door, and a few crumbs of a muffin left on the counter for a couple of hours showed me why &#x2014; ants. There was Raid under the sink. Aha. I opened windows, but that cooled the place off more than the small space heater could overcome entirely. The second day the smell was mostly gone and I just kept food out of the apartment unless I was eating. Thank you for taking a moment to leave your feedback on Carson Cottage. I'm very sorry to hear you experienced issues with ants, we try to be very proactive in dealing with any pests, and use sprays when necessary. However, I did the walk-through for this property before your check in and did not use any insect spray, it could have been a combination of cleaners we used to clean up after the previous guests. My apologies for that, I also did not see any crumbs and certainly not any ants in the counter or would have taken care of that, could have been a stray crumb from the toaster we cleaned. I'm sorry you were not very happy with those things, in the future, you are always encouraged to call the property managers who would be happy to come over and take care of those things for you. We appreciate your feedback and thanks again for taking a moment to share yours. This apartment is well equipped with everything you need to make it a homebase for exploring the Eureka area and a really pleasant porch with apples on the tree. For 2 people this is a cute place and has just about everything one would need for a short stay. There was no drain plug in the bathroom sink, which is a problem and the walls of the shower could have been sprayed with a Mildew product. Even though the window in the bathroom is textured it faces right out on the deck. I would have preferred a curtain in that window. The bed was nice, the kitchen clean and a bag of gourmet cookies with a day's worth of coffee greeted us. Thank you for your review of Carson Cottage! Glad to hear you enjoyed your stay. Regarding the bathroom window, because it's facing a private porch, we felt all that was needed was the clear textured panel, to allow more light into the bathroom, but I will take your comment into consideration, as well as doing a deep clean on the tub and shower. Please come back and visit us again soon, we'd love to have you back on the North Coast anytime! Look us up at Redwood Coast Vacation Rentals when planning your next trip. Mostly very pleasant stay. Although very small, this unit has just about everything needed for a cozy, comfortable short stay. The location is a good one to explore the redwood forests in the national and state parks along the coast; it's also close to many beaches, of course. This was a very quiet place, which I appreciated. Eureka looks like a working class town, and I didn't feel the desire to explore any of it, having read online that it is not safe at all. However, I did not have any situations arise to cause any alarm. Concerning the unit itself, the toaster was broken, and the portable AC/heater unit did not emit any cool air, only hot air. The gas flame on the stove would not ignite, and there were no matches around to get it going. Thank you for your review of Carson Cottage. I was happy to be able to replace the toaster as soon as you let me know it was non functioning. We do not have A/C at the unit, just some portable heaters for any chilly evenings. Air conditioning is a rarity in Humboldt County, as we are usually in the 70's most summers, though that seems to be changing. Thanks again for taking a moment to leave a review, and I'm happy to hear you enjoyed your stay!